Walt Disney famously said, “the way to get started is to quit talking and begin doing.” That’s the journey some 65 teams in the Make-GE Robot Hack have undertaken. In just a few short weeks their small steps became a running stampede. From beginners to experts, teams brought curiosity and enthusiasm to our virtual hack. Inspired by the theme of “humanoid robots,” and armed with a basic kit of components, (thank you GE) they’ve been stimulated by online presentations from Master Makers and by each other. Take a look at our Robot Community Pages to see the diversity of ideas. Teams formed in hackerspaces, in schools and museums, or simply in homes. Projects range from playful to serious. Participants explored robotic vision, movement, interaction, and learned intelligence. Join us Wednesday at 4pm PT at our Robot Hacks Finale where we will present some of these projects. Some teams “began doing” with brainstorming sessions. Others turned to sketchpads. A few just opened up their kits and started building. Team Tree Trunk, in Big Cove, Alabama, drew their inspiration from a discussion of interactive yard sculpture. In Portsmouth, New Hampshire the Seacoast Robotics team, inspired by the creators of Jimmy the Robot, (see video) is building a puppet called Scaredy Cat. In Tampa, Florida, Chuck Stephens writes that his team decided to join forces with another local team and make two robots that interact. A French team found inspiration in a second hand store. 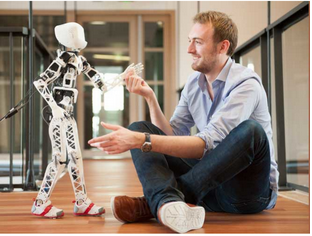 Human-robot interaction has been a passion of Ross Bochnek’s for years. “Haptix Entix” is his most current effort. Jay Shergill and his daughter noodled over dozens of possibilities. He writes: “I had a number of ideas about what I wanted to make… My daughter’s ideas were significantly more ambitious —flying, wall crawling, dancing, hearing seeing, talking thinking robots.” They finally settled on an Itty Bitty Drawing Robot. Follow their progress on Jay’s blog. At the Omaha Children’s Museum, Swain explains “perhaps we got in a little over our heads. But over the last two weeks I have accomplished things that I had been talking about for the past year, learning Arduino, establishing a VNC client, exploring multiple operating systems for the Raspberry Pi, teaching children how to format the SD cards, and for the first time ever we had really successful breadboard workshops taking place. Small steps lead to great destinations.